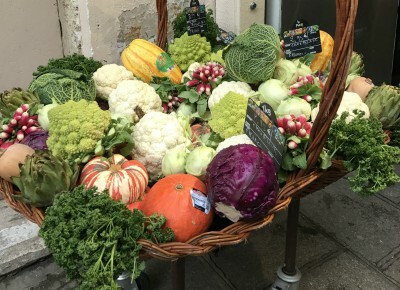 Most Parisians prefer to purchase fresh ingredients and foodstuffs from the local street markets rather than grocery stores, and Paris boasts dozens – some open-air, some covered, and some pedestrian-only. The markets can be found almost daily across the city, and offer everything from fresh breads, pastries, produce, flowers, cheeses, meat, poultry and seafood, to kitchen items, linens, clothing, antiques, hardware, shoes and more. Paris is divided into 20 neighborhoods (or administrative districts) known as arrondissements, which spiral out from the heart of the city. 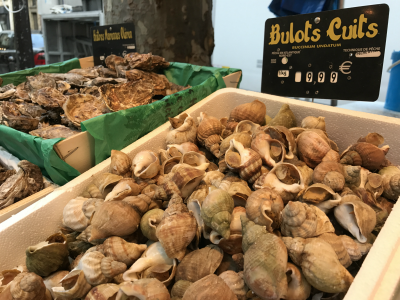 The city of Paris encourages each arrondissement to host a market at least twice a week, and they are a great place to soak up the flavors of the neighborhood. Street markets reflect the distinct personality of each neighborhood, and it can be difficult to choose which markets to visit and when. Some fortunate arrondissements feature permanent market streets, which offer fresh goods to residents and visitors almost daily. Edged with cafés, restaurants, and specialty shops, these streets are mostly pedestrian-only and allow only foot-traffic (save for the occasional delivery vehicle). Two of the most enchanting and famous market streets in Paris are the Rue Cler in the 7th arrondissement and the Rue Mouffetard in the 5th. A cobbled beacon for literature lovers and market seekers alike, this permanent market in the Latin Quarter was a favorite haunt of writer Ernest Hemingway and was made famous in his memoir, A Moveable Feast. Hemingway called Rue Mouffetard a “wonderful, narrow crowded market street” and it’s not a cliché when referencing this area of the Left Bank. The charming lane winds its way gently downhill from the Place de la Contrescarpe to the lower end near the Square Saint-Médard. “Breathe Paris in, it nourishes the soul,” said French writer Victor Hugo, and it is nearly impossible to not be fortified while wandering Rue Mouffetard. The sweet smell of macarons, the heady aroma of roasting chicken, the delicious scent of freshly-baked treats wafting from the patisseries, the vibrant hues of the fresh produce, the briny glimmer of fresh oysters resting on ice all make exploring this area irresistible. The open-air market stalls offer seasonal fresh fruits and vegetables, sausages, rotisserie chicken, cheeses, meat and seafood. Stop at Oliviers & Co to taste outstanding olive oils and vinegars. This French company is based in Mane, and has exacting standards for their delicious Mediterranean products. Wander into Librairie L’arbre du Voyageur (or The Tree of the Traveler Bookshop) and browse for French or foreign literature, children’s books, and tomes on history, humanities and sociology. Choose a table at Café Le Mouffetard – the perfect spot for a classic French meal. Frequented by discerning locals, the café serves generous portions of delicious bistro fare in a cozy and quaint setting. The melty, robustly flavored cassoulets alone are worth the trip. The café décor and clientele offer such an authentic Parisian dining experience, you’ll almost expect Hemingway himself to stroll in off the cobbled street. Rue Cler, where Julia Child shopped while living in Paris, is located in the 7th arrondissement near the Eiffel Tower. Once home to nobility, the area exudes the tasteful flair of its aristocratic past. This wide, walkable street still caters to the discerning palate of the lucky Parisians who shop here. The French gourmet tea company Mariage Frères has been delighting Parisians with its legendary blends since 1854. The Rue Cler shop houses a tea emporium, restaurant, and tea salon, and is open seven days a week. Guests can enjoy “Cuisine au Thé” (“French Cuisine with Tea”), with main courses and desserts prepared daily. Try the well-loved Marco Polo blend, a velvety combination of Chinese and Tibetan flowers. Rouge Bourbon, a caffeine-free style tea with a mellow French vanilla taste, is perfect for evening sipping. The picturesque La Fromagerie offers every rind, wheel, wedge and slice of cheese you would expect to see in a French cheese shop, and the staff is helpful and patient. This is a superb place to purchase delicious supplies before heading to picnic on the grassy lawn beneath the Eiffel Tower. Just steps away at 12 Rue du Champ de Mars you’ll find the shop of legendary cheese maker Marie-Anne Cantin whose eponymous fromagerie ages their cheese traditionally in on-site cellars and supplies cheese to the The Élysée Palace. Perfectly located on the corner of Rue Cler and Rue du Champ de Mars, Café Central is a prime location for lunch, and people watching, on the terrace. Freshly made daily specials and outstanding charcuterie and cheese platters pair well with Café Central’s large wine and champagne list. 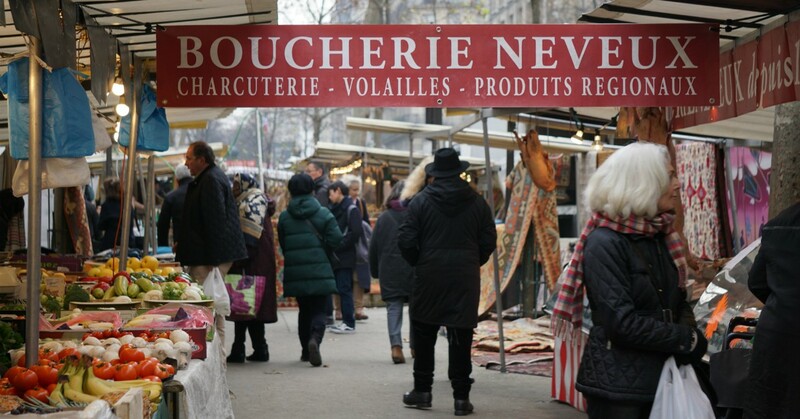 While the popularity of Rue Cler has increased along with its famous customers – travel writer Rick Steves calls it his “favorite street in Paris” – it remains an essential destination for street market aficionados. Exploring the street markets is the quintessential Parisian pastime, and offers a wonderful glimpse into each distinct neighborhood and the people who live there. Note that many stalls and shops on Rue Cler and Rue Mouffetard are closed on Mondays. 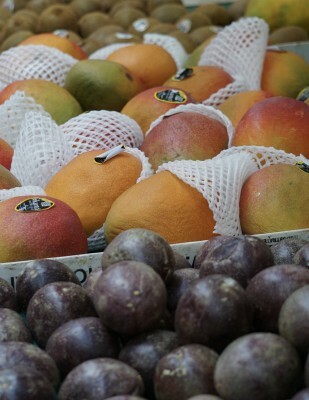 Visit http://marche.equipement.paris.fr/tousleshoraires for a schedule of rotating neighborhood markets.